Biography of High Renaissance Painter, Leader of Parma School of Painting. The enigmatic artist Antonio Allegri da Correggio was one of the most significant Old Masters of the Parma school of the Italian High Renaissance. Strongly influenced by Andrea Mantegna (1430-1506) and Leonardo Da Vinci (1452-1519), and later by Michelangelo (1475-1564) and Raphael (1483-1520), Correggio was a pioneer of illusionistic painting and sfumato. Aiming to achieve the best possible expression of lightness and grace, he used tone and colour to counterbalance his line and forms, thus creating new and unusual effects of light and shadow. His use of foreshortening and overlapping made him a master of three-dimensionality. In addition, Correggio sketched some of the best drawings of the Renaissance. His most famous paintings include: The Vision of St John the Evangelist (1522, Church of San Giovanni Evangelista, Parma), Adoration of the Shepherds (1528, Gemaldegalerie Alte Meister, Dresden), the Assumption of the Virgin (Parma Cathedral) (1524-30), and Jupiter and Io (c.1531, Kunsthistorisches Museum, Vienna). Both oils and frescoes by Correggio anticipated Italian Baroque artists of the 17th century, like Pietro da Cortona and Andrea Pozzo, and also the Rococo art of painters like Giambattista Tiepolo (1696-1770) and Francois Boucher (1703-1770). After achieving a modest reputation during the cinquecento, he became highly revered during the 18th century. Since then his reputation has experienced something of a decline. Named after a small town near Reggio Emilia, Correggio's early life is badly documented. Other than the fact that he was born into a large and poor family, little is known about his early life or how he came to take up fine art painting. In addition to a basic training from his painter-uncle Lorenzo Allegri (d.1527), he is believed to have trained in the workshop of Francesco Bianchi Ferrara of Modena, and may even have studied in Mantua with the elderly Mantegna. Remembered as a melancholic, shy and introverted character, Correggio's most typical works are items of altarpiece art and small-scale, intimate devotional panels. However, he also executed a number of highly important and influential architectural fresco paintings. His later series of sensuous mythologies were even more forward-looking. In 1514, Correggio completed three tondos for the entrance of the church of St Andrea in Mantua, before returning to his home town where he signed a contract for an altarpiece in the local monastery of S. Francesco. This work, Madonna with St Francis (1514-15, Gemaldegalerie Alte Meister, Dresden) shows traces of Lorenzo Costa (1460-1535) - who influenced the Carracci-led Bolognese School of painting - and Leonardo Da Vinci. 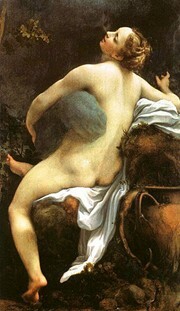 By 1516, Correggio was in Parma, where he remained for much of his career. In 1519 he married Girolama Francesca di Braghetis, also from Correggio, who died prematurely in 1529. One of his sons, Pomponio Allegri, became a mediocre painter. Correggio's first important commission was a ceiling fresco - Camera di San Paolo (1519) - at the Convent of St Paul in Parma. A highly innovative form of interior decoration, it incorporated classical as well as more whimsical elements. After this, he painted the illusionistic Vision of St. John the Evangelist on Patmos (1520-21) for the dome of the church of San Giovanni Evangelista. 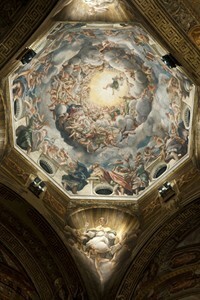 In his second dome fresco, for the Cathedral of Parma, he painted a sensational Assumption of the Virgin (1524-30). Both these religious paintings employed quadratura as well as an illusionistic sotto in su perspective, and had a huge impact on later mural painting, including works by the Bolognese painter Carlo Cignani (1628-1719), the Piedmont artist Gaudenzio Ferrari (1480-1546), the Venetian Pordenone (1483-1539), the Baroque painter from Parma, Giovanni Lanfranco (1582-1647), and the Genovese artist Giovanni Battista Gaulli (1639-1709) known as Il Baciccio. Correggio's mythological painting is especially sensual and ahead of its time. His masterpieces include: Danae (c.1531, Galleria Borghese, Rome), Ganymede abducted by the Eagle (1531-32, Kunsthistorisches Museum, Vienna) one of the four mythological paintings commissioned by Federico II Gonzaga, Jupiter and Io (1531-32, Kunsthistorisches Museum, Vienna), and Leda with the Swan (1531-32, Staatliche Museen, Berlin). Correggio's other masterpieces include pictures like: Lamentation (Deposition) (1525, Galleria Nazionale, Parma) and The Martyrdom of Four Saints (Galleria Nazionale, Parma). The latter is notable in that it informed later Baroque compositions such as Truth by Bernini (1598-1680) and Death of Saint Agnes (1660) by Ercole Ferrata (1610-86). Correggio had no workshop filled with apprentices and assistants, nor any immediate successors or followers - save, perhaps the Parma artists Giovanni Maria, Francesco Rondani, Parmigianino, Bernardo Gatti and Giorgio Gandini del Grano - nor did he have any enduring impact on the art of the 16th century. (According to Giorgio Vasari, Correggio suffered by being a provincial artist.) But around the start of the Baroque era (c.1600), as the Mannerist style lost ground, his painting began to be more widely appreciated as being on a par with that of Michelangelo and Raphael. Broadly speaking, his work is now considered to have been revolutionary and deeply influential on later artists, including Pietro da Cortona - see his Allegory of Divine Providence (1633-39, Palazzo Barberini); and Andrea Pozzo, the greatest trompe l'oeil mural painter of the High Baroque in Rome - see his Apotheosis of St Ignatius (1688-94, Sant'Ignazio, Rome). - Judith and the Servant (c.1510) Musee des Beaux-Arts, Strasbourg. - Madonna (1512-14) Castello Sforzesco, Milan. - Madonna and Child with the Young Saint John (1516) Prado Museum, Madrid. - The Mystic Marriage of St Catherine (c.1517) Louvre Museum. - The Adoration of the Magi (1516-18) Brera, Milan. - Virgin and Child with Angel (Madonna del Latte) Museum of Art, Budapest. - The Rest on the Flight to Egypt with Saint Francis (1517) Uffizi Gallery. - Portrait of a Gentlewoman (1517-19) Hermitage, St. Petersburg. - Adoration of the Child (1518-20) Uffizi Gallery. - Madonna della Scala (c. 1523) Galleria Nazionale, Parma. - Noli me Tangere (c.1525), Prado Museum, Madrid. - Ecce Homo (1525-30) National Gallery, London. - Madonna della Scodella (1525-30) Galleria Nazionale, Parma. - Madonna of St. Jerome (1527-28) Galleria Nazionale, Parma. - The Education of Cupid (c.1528), National Gallery, London. - Venus and Cupid with a Satyr (c.1528) Louvre Museum. - Adoration of the Shepherds (1528-30) Gemaldegalerie Alte Meister, Dresden. - Madonna with St. George (1530-32) Gemaldegalerie Alte Meister, Dresden. - Allegory of Virtue (c.1532-34) Louvre Museum. Paintings by Correggio can be seen in many of the best art museums throughout the world.